Opening in the former East of Main space at 223 East Georgia, Ramen Butcher will serve lunch and dinner from a small menu aimed at letting their star dish, tonkotsu ramen, shine. Ramen Butcher is the first North American franchise to come ashore from the mighty Menya Kouji, a Japanese-based franchise group with 150 ramen shop locations. Run by a collective of inspired ramen chefs who trained under the tutelage of Japanese ramen master Kazuo Yamagishi, Menya Kouji is known for opening diverse ramen-centric restaurants under their banner. Their first stop on this continent is Vancouver’s Chinatown, where Ramen Butcher is being prepped for an early-February launch. 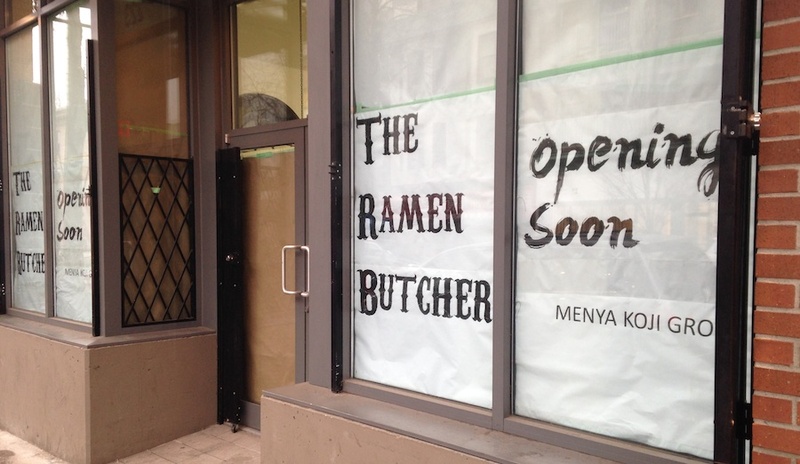 Ramen Butcher is opening under the supervision of Kaito Kaneyoshi, a Managing Director with Menya Kouji who is heading up the company’s whole North American expansion. Kaneyoshi, a Vancouver native with a longstanding dream to go into the restaurant business, had plans to open his own ramen shop when, while doing business in Japan, he connected with Menya Kouji, and went to work for them to bring their ramen to Vancouver and beyond. As Kaneyoshi conveys, there’s a spirit of gratitude and tradition of honouring the life and work of ramen innovator Yamagishi that propels his company and its chefs. The subject of an award-winning 2013 documentary “The God of Ramen,” Yamagishi is known world-wide for the legacy he nourished at his Tokyo ramen shop, Taishoken (Vancouver’s Taishoken has no affiliation). People would line up for two or three hours to get a bowl of Yamagishi’s ramen, cementing his role in the evolution of ramen as almost its own Japanese cultural entity. Though “ramen culture” is a little different outside of Japan, it’s still a wildly popular branch of Japanese cuisine with its own enthusiasts around the world. Part of Yamagishi’s legacy is that he took anyone who wanted to learn how the “God of Ramen” made his delicious broth and noodles under his wing and shared his recipes. Among the hundreds of people he taught are the chefs who formed Menya Kouji as a way to show their thanks, and also to help Yamagishi live out his dream of showing the world what delicious Japanese ramen is. For Ramen Butcher, Menya Kouji is exporting to Vancouver a specially-designed tonkotsu ramen recipe, and a top-tier chef to oversee the restaurant’s launch. Many of the ingredients will be locally sourced, though other core harder-to-get ingredients will be imported so as to make sure the ramen is consistent. Having honed his palate for ramen recently in Japan, consuming a staggering three to four bowls daily, Kaneyoshi speaks from experience. His “absolute love for ramen,” is partly what is propelling him to bring Ramen Butcher to Vancouver, and, ultimately, the Menya Kouji dedication to ramen, to the rest of North America. For Vancouver, Kaneyoshi admits there are other locations in the works, but he’s keeping quiet about the specifics for now. Ramen Butcher is also keeping their full menu under wraps until their debut, but look for other hand-crafted items like gyoza (dumplings) up for order when their Chinatown flagship launches. The choice to put a ramen shop in Chinatown makes sense to Kaneyoshi, who cites the neighbourhood’s recent evolution as one of the reasons why the company is starting there in Vancouver. “Where this area is going in terms of the restaurant industry is exciting,” says Kaneyoshi of Chinatown, adding that with minimal renovations to the East of Main restaurant they’re able to open with a short turnaround. Ramen Butcher is gearing up for a February 6 grand opening, when they’ll have both lunch (11 a.m. to 3 p.m.) and dinner (5 to 10 p.m.) service. Look for a few days of soft opening service starting February 1, with hours open to the public later in the day.